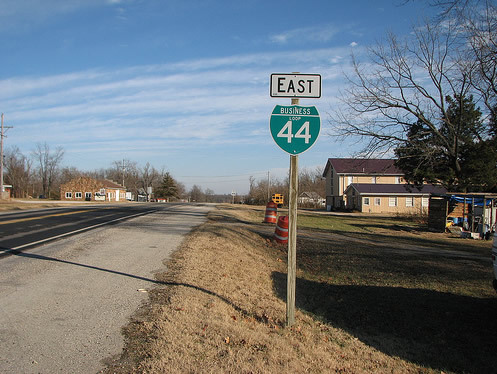 Interstate 44 has nine active business routes in Missouri. All of the loops utilize portions of U.S. 66, which I-44 replaced from Oklahoma City east to St. Louis. 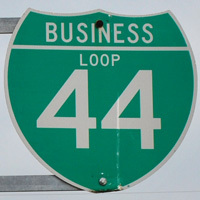 Business Loop I-44 travels 11.84 miles in an L-shaped route through Newton and Jasper Counties in southwest Missouri. The route combines with Missouri 43 north from Exit 6 along Hearnes Boulevard north to 32nd Street along a divided arterial. Main Street (old U.S. 71 Business) takes over as a commercial boulevard to Downtown Joplin and 7th Street. The remainder of the route travels east along Missouri 66 (Historic U.S. 66) to Business Loop I-49 near Northpark Mall, northern Duquesne, the Missouri 249 freeway and across the city of Duenweg. 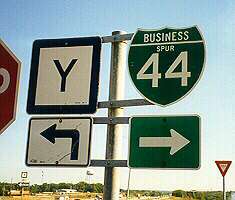 The business route ends at a wye interchange (Exit 15) with I-44 adjacent to Cimarron Road. The second Jasper County business route from I-44 loops southward from Exits 26 and 29. The western two thirds of the 4.33 mile route doubles as Missouri 37 south from I-44 to Blackberry Road (old U.S. 66 west to Parshley) and east to 14th Street in the city of Sarcoxie. High Street east from MO 37 back to I-44 is locally maintained and also Historic U.S. 66.
Business Loop I-44 connects I-44 with the Lawrence County seat of Mount Vernon along a 2.74 mile loop. 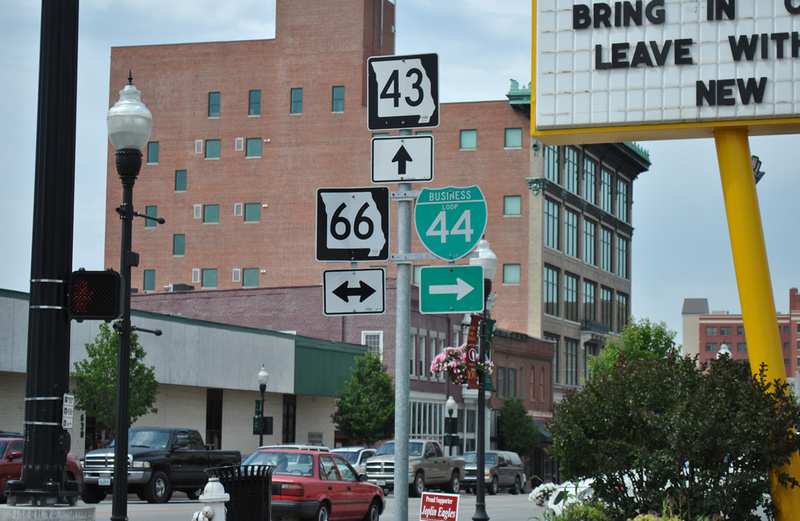 Following old U.S. 66, the route begins at Exit 44 opposite Highway H. Once in the city limits, Business Loop I-44 becomes Mount Vernon Boulevard. Missouri 39 overlaps with the route from Spring Park Boulevard east as Mount Vernon Boulevard expands into a commercial arterial. The business loop ends at Exit 46, as Missouri 265 begins a 66.94 mile route to U.S. 65 outside Branson. This business loop commences a 9.66 mile route from Interstate 44 at Exit 72. It follows Chestnut Expressway east to Glenstone Avenue, then turns north on Glenstone to rejoin Interstate 44 at Exit 80. Glenstone Avenue is old U.S. 65, and Chestnut Expressway east to College Street is old U.S. 66 and later U.S. 66 Business (east from U.S. 160 / West Bypass). Chestnut Expressway was constructed north by the early 1960s as the original bypass for Downtown Springfield. Business Loop I-44 in Lebanon leads north from Exit 127 by an array of motorists services along Elm Street. Elm Street curves northeast to match the street grid southeast of Downtown and returns to I-44 east at Exit 130. With the exception of the route east of Seminole Avenue to Exit 130, the 3.67 mile Business Loop I-44 at Lebanon follows all of old U.S. 66. Beginning at Exit 153 near Buckhorn within Mark Twain National Forest, the 9.07 mile route of Business Loop I-44 parallels I-44 closely along side Missouri 17 northeast into the city of Waynesville. Following Historic U.S. 66, Business Loop I-44 & MO 17 wind eastward to the Waynesville city center, where the state highway splits for Crocker to the north. The remainder of Business Loop I-44 is locally maintained as it continues east from Waynesville into the city of St. Robert, ahead of Route F. Shifting southward from I-44 at Exit 159, the business route passes through Gospel Ridge to end at Exit 161 along side Business Spur I-44 north from Ft. Leonard Wood. Business Spur I-44 leads south from Exit 161 and the city of St. Robert to the U.S. Army installation at Fort Leonard Wood. The 2.23 mile route initially overlaps with Business Loop I-44 west as it leads back toward Waynesville. This results in a rare instance where a Business Loop and Spur intersect, as the two separate south of Exit 161 at Historic U.S. 66 and Route Z. The remainder of Business Spur I-44 otherwise lines Missouri Avenue, a commercial arterial, southward to the main gate to Fort Leonard Wood. 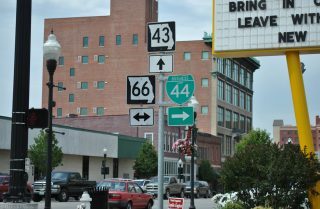 Traveling 2.43 miles, Business Loop I-44 follows Historic U.S. 66 east from Exit 184 along Kingshighway to U.S. 63 (Bishop Avenue). Combining with U.S. 66 north, the two highways circumvent the city center and the campus of Missouri University of Science and Technology along a commercial boulevard to Exit 186. 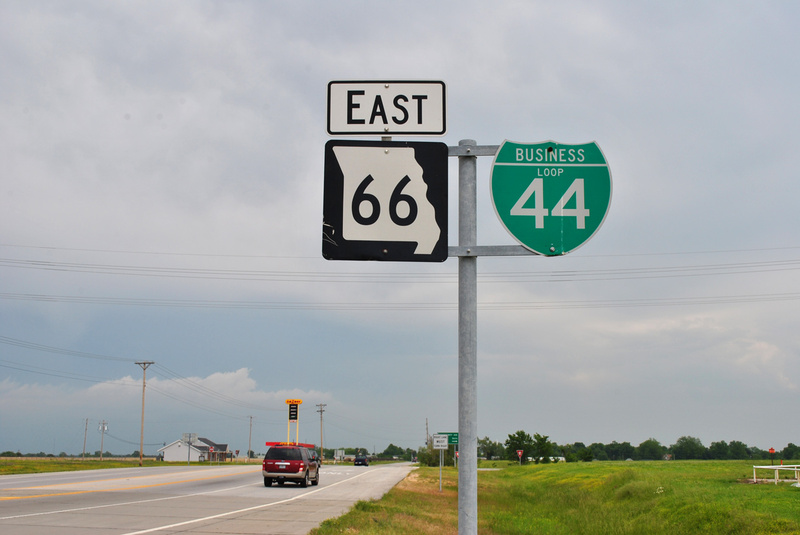 The final business route for I-44 travels 8.94 miles of Historic U.S. 66 between Exits 257 and 261. The route follows Osage Street through unincorporated Grays Summit, just to the south of I-44, to western reaches of the Pacific city limits. Ramps from I-44 east at Exit 256 provide a second access point to Business Loop I-44 ahead of the Pacific street grid. Interstate 44 shifts northward from Pacific as Historic U.S. 66 parallels two railroad lines across a valley to the south. The two routes come together again at Exit 261 in west Eureka, adjacent to the Six Flags St. Louis theme park. 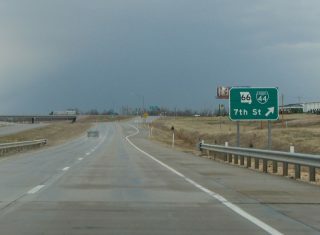 As approved by AASHTO, Business Loop I-44 at Pacific and Eureka was extended west to Grays Summit via South Outer Road on May 30, 2003.
Business Loop I-44 ends an overlap with Missouri 43 (Main Street) and combines with Missouri 66 along East 7th Street between Downtown Joplin and Duenweg. Photo taken 05/04/12. 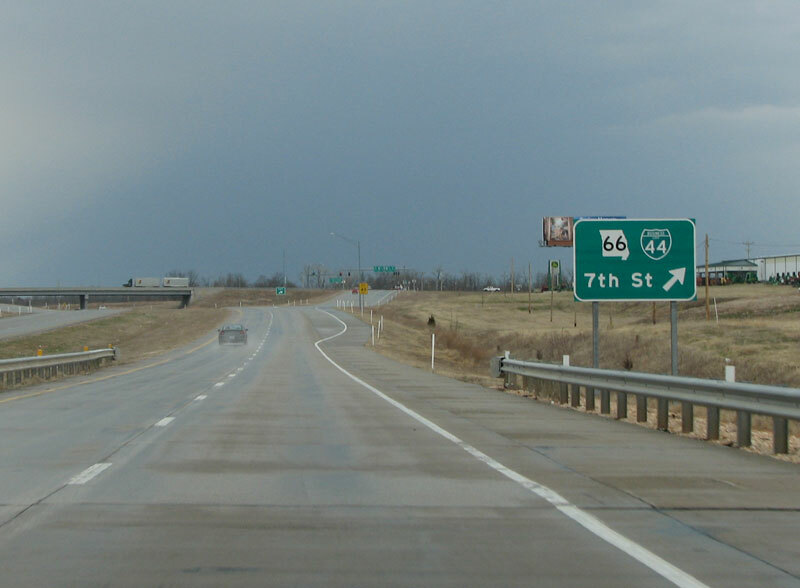 Historic U.S. 66 through Joplin included Alternate, Business and Bypass alignments. The primary alignment for U.S. 66 followed Main Street north from Downtown to Broadway Street east, St. Louis Avenue north, Euclid Avenue north, Utica Street east, Florida Avenue north and Zora Street east. Missouri 249 begins and meets Business Loop I-44 & Missouri 66 at its first interchange east of Joplin. Photo taken March 2009.
Business Spur I-44 follows Missouri Avenue south from Exit 161 while Route Y meanders 6.70 miles north toward the Riddle Bridge across the Gasconade River. Photo taken by Mark Roberts (1999). 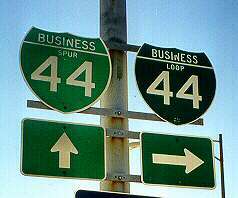 Business Loop I-44 west splits from Business Spur I-44 (Missouri Avenue) south as both depart from Interstate 44 at Exit 161. Photo taken by Mark Roberts (1999). There was one other instance of a Business Loop intersecting a Business Spur. That occurred in Winslow, Arizona until 2007, when Business Loop I-40 there was decommissioned. Business Loop 44 eastbound near Sarcoxie, Missouri. This photo is part of David Backlin‘s road photo collection on Flickr.